The Royal Leicestershire Regiment was a daunting part of life in Leicester during the First World War. Perhaps this was because those that were conscripted or volunteered of their own accord would join this regiment. Before the war, the Regiment has a colourful and highly honoured history, all of which can be found on our website. If you have some information that you cannot find their, please contact me. The regimental headquarters was housed in a collection of buildings in Oxford Street, Leicester. One of these buildings was what today we would call the Magazine Gateway. As you can see from the picture it was originally joined on to some other buildings (which were the barracks) which have been demolished today. 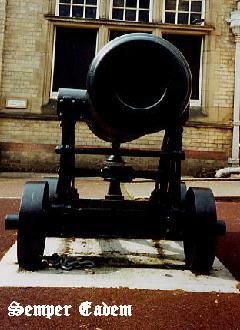 The cannon shown here was used by the Royal Leicester Regiment. 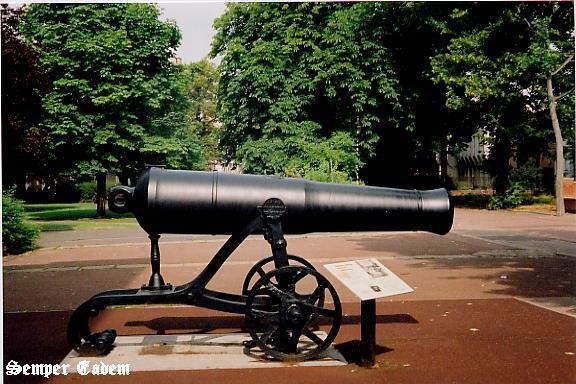 It is one of a pair located outside the New Walk Museum..